KO Artist on Weight. 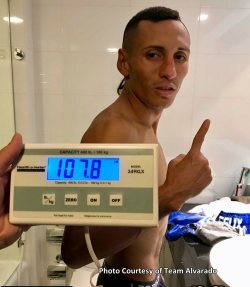 Heavy-handed Nicaraguan Felix "El Gemelo" Alvarado - the dangerous foe for Filipino Randy Petalcorin - tipped his own unofficial scale at 107.8 pounds (48.9 kilos) Tuesday at his hotel room in Manila, five days prior to the official IBF weigh-in ceremony scheduled for Sunday morning (Oct 28). The Nicaraguan striker is already below the required 108 pounds. For the official IBF weigh-in ceremony - which will take place at TV5 Studios in Mandaluyong, Metro Manila - Alvarado, 29, and Petalcorin, 26, can not exceed the limit of the Jr. Flyweight division, 108 pounds (49 kilos). The IBF # 1 Alvarado - an experienced orthodox boxer who presses the action striking hard with both hands - is in line to battle Filipino former world beltholder Randy "Razor" Petalcorin (29-2-1, 22 KO's) of General Santos City for the vacant International Boxing Federation (IBF) 108 lbs world strap this coming Monday (Oct 29) at Midas Hotel & Casino along Roxas Boulevard in Pasay, Metro Manila. The Nicaraguan arrived in the Philippines Monday evening and Tuesday morning the 2-time world title challenger was running on the treadmill, sweating on shadow boxing and doing the mitts, looking strong, perfectly fit and ready for the important televised battle. 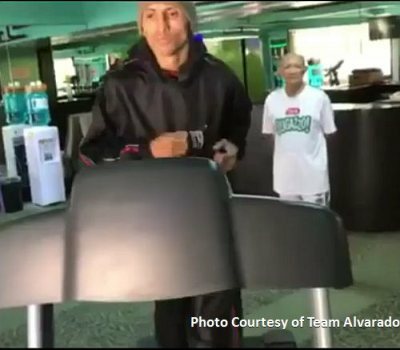 Alvarado runs on a treadmill at his hotel in Manila. Interestingly enough, the only two loses in Alvarado's record (33-2, 29 KO's) have been defeats by points during competitive world title challenges against tough world champions. Alvarado's first defeat was to outstanding Nippon 108 lbs king Kazuto Ioka (23-1, 13 KO's) in Osaka, Japan, in 2013; the second one came the following year against 112 pound ruler Juan Carlos Reveco (39-4, 19 KO's) in Buenos Aires, Argentina, in 2014. Both were loses by points as Alvarado has never been stopped. In contrast, his Filipino opponent has been stopped. Petalcorin was ravaged in two rounds by fellow Mindanao fighter Marlon Tapales (31-2, 14 KO's) in Manila back in 2010. Will the Alvarado land hard damaging blows on Petalcorin to overpower the Filipino fighter of the Sanman Boxing Stable, as the Nicaraguan striker intends to do? Or will local hero Randy Petalcorin, a man who knows no fear, perform flawlessly, outboxing, outmaneuvering and confusing the missing Alvarado to score the most important, brilliant and rewarding victory of his boxing career? Boxing fans can find out by attending the exciting battle at Midas Hotel & Casino, which is admission free; or by tuning-in to ESPN 5 Philippines at 7 PM on Monday October 29. The Randy Petalcorin vs Felix Alvarado clash for the IBF Jr. Flyweight world title is an exciting production of General Santos City award winning promoter Jim Claude Manangquil of SANMAN Promotions in association with Peter Maniatis Events and MP Promotions.